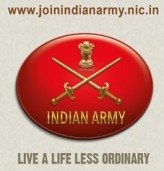 Applications are invited from eligible male candidates for recruitment as Havildar Education in Science and Arts streams in the Army Educational Corps of Indian Army. No of posts: Vacancies will be released at the end of recruiting process by the concerned Army authorities. Age : Candidates age should be 20-25 years for Civilian candidates (born between 01-10-1992 and 30-09-1997 inclusive of both dates), 20 to 28 years for Serving Combatants on Remusteration (born between 01-10-1989 and 30-09-1997 inclusive of both dates) as on 01-10-2017. Educational Qualification: The candidate must have working knowledge of either English or Hindi or both. Candidate should have graduation / post graduation degree from a recognised university in relevant discipline.